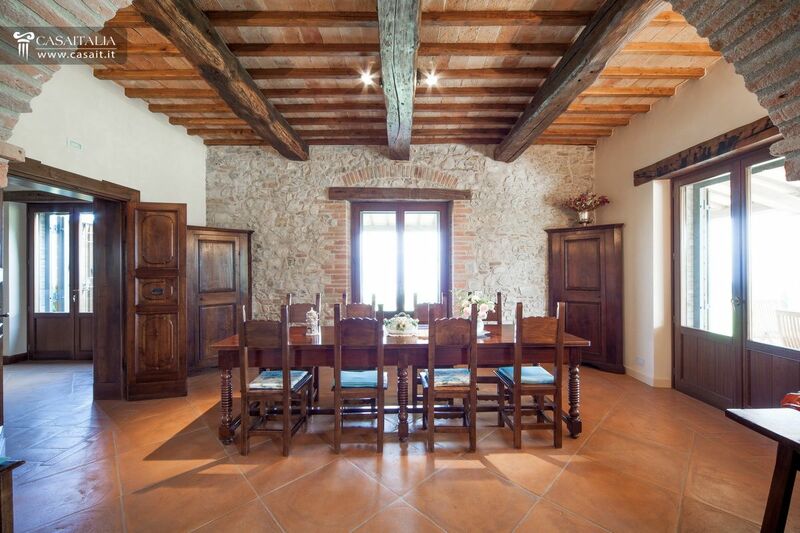 Traditional, restored farmhouse with tower, surrounded by 1.4 hectares of land with garden, swimming pool, olive grove and small vineyard. 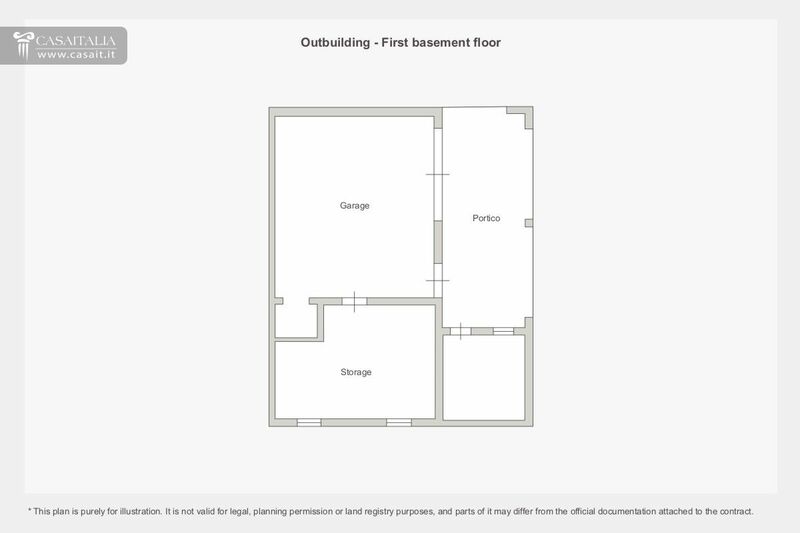 Outbuilding for guests and separate staff apartment. 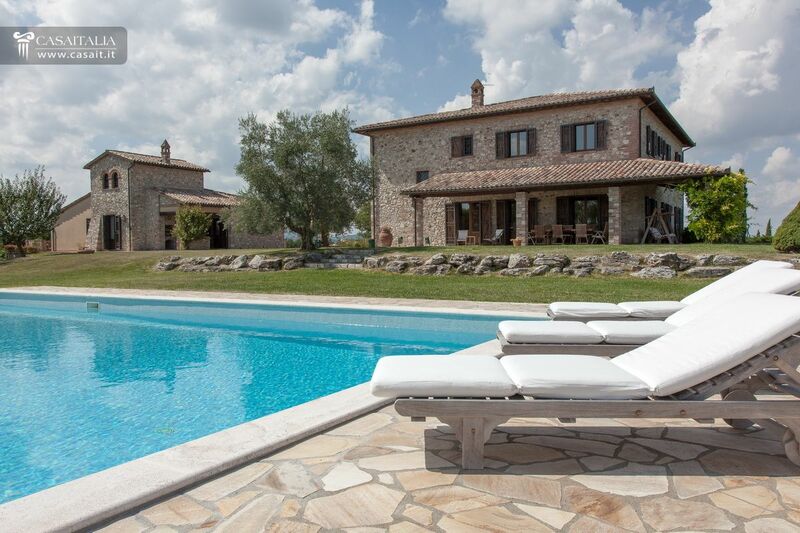 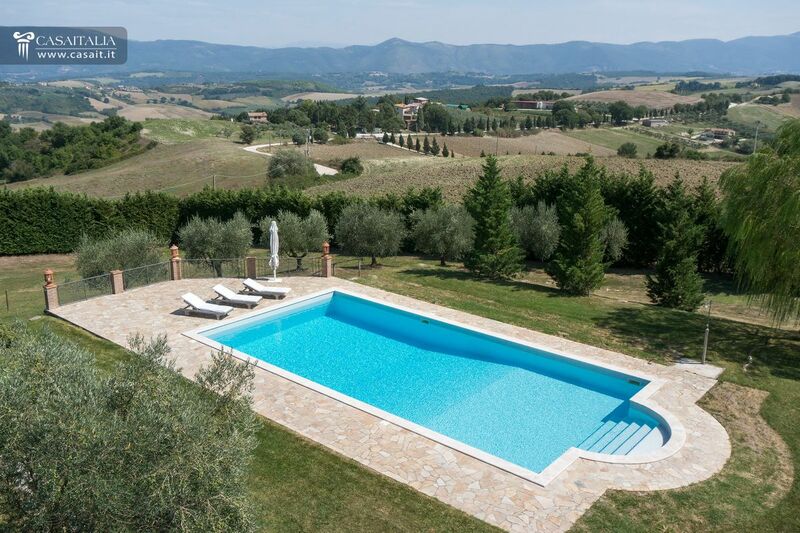 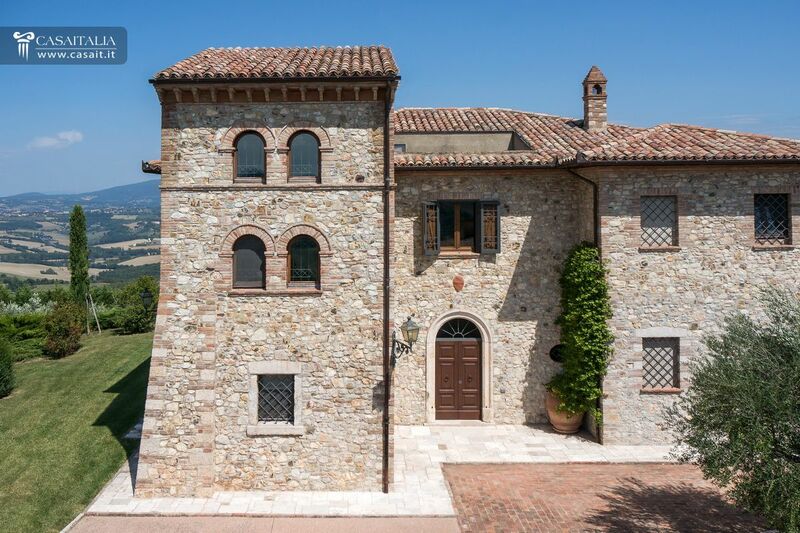 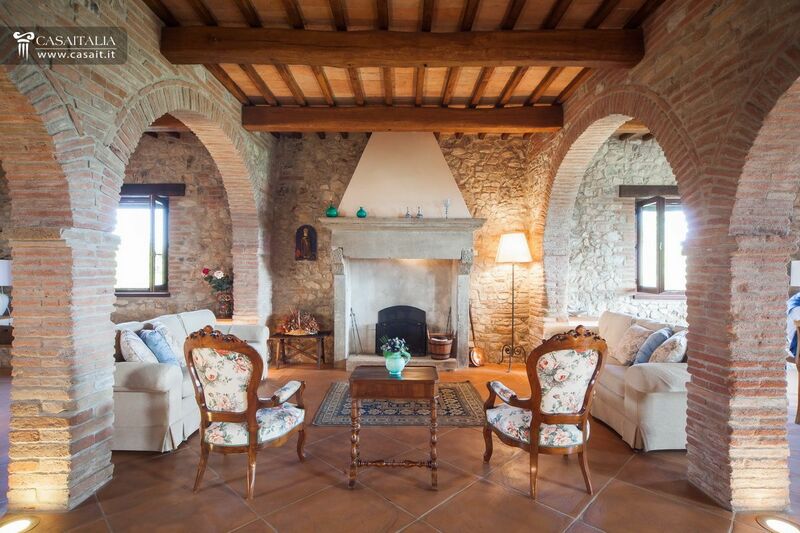 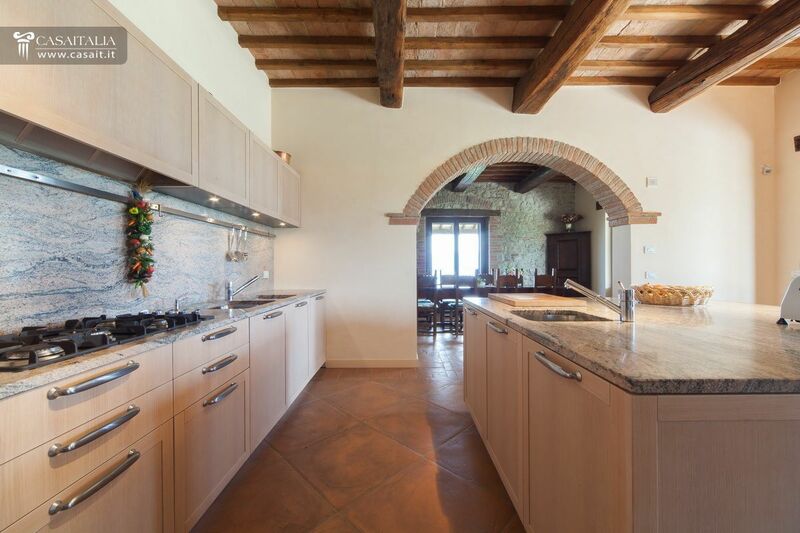 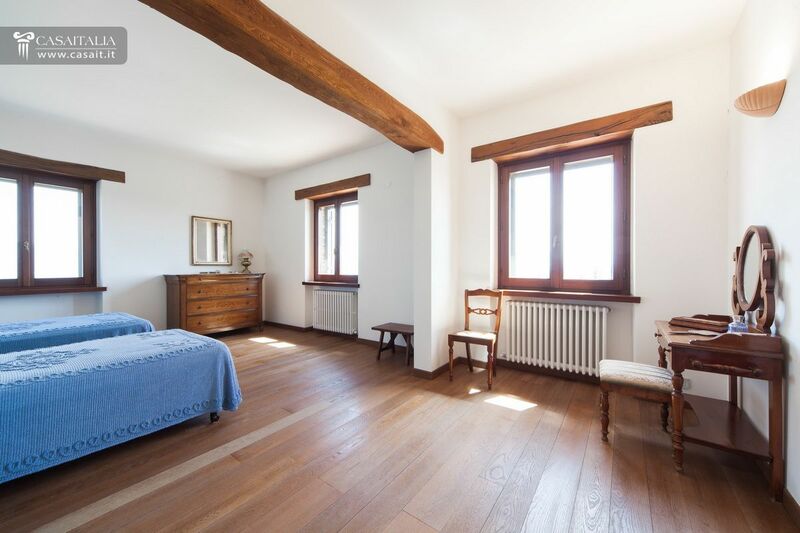 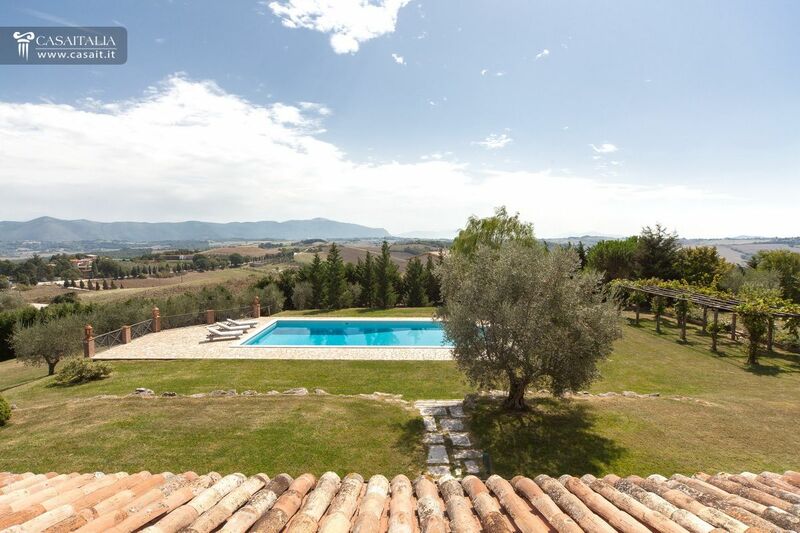 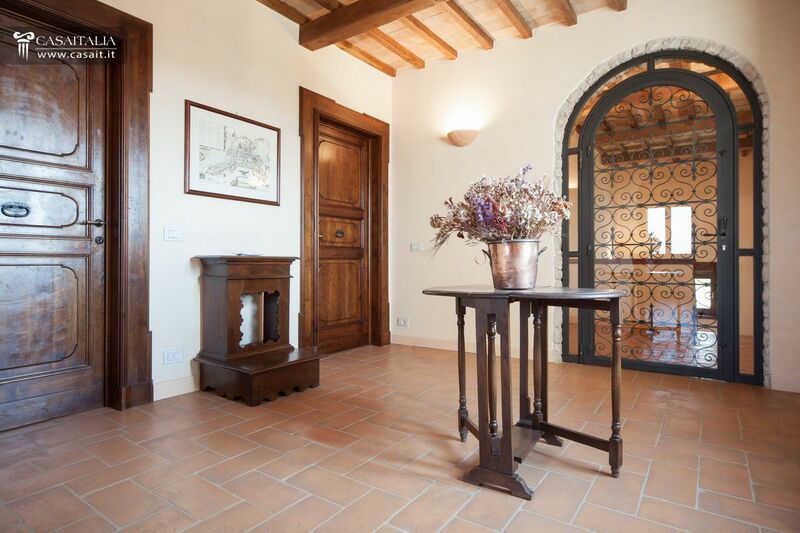 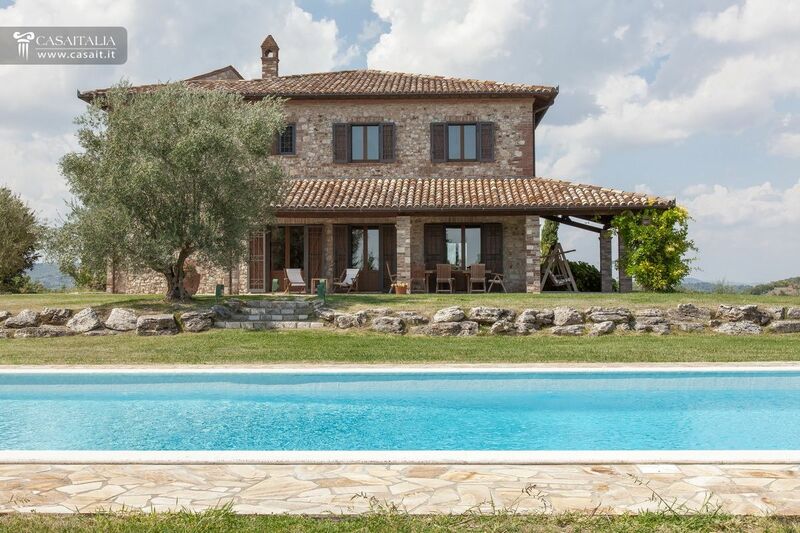 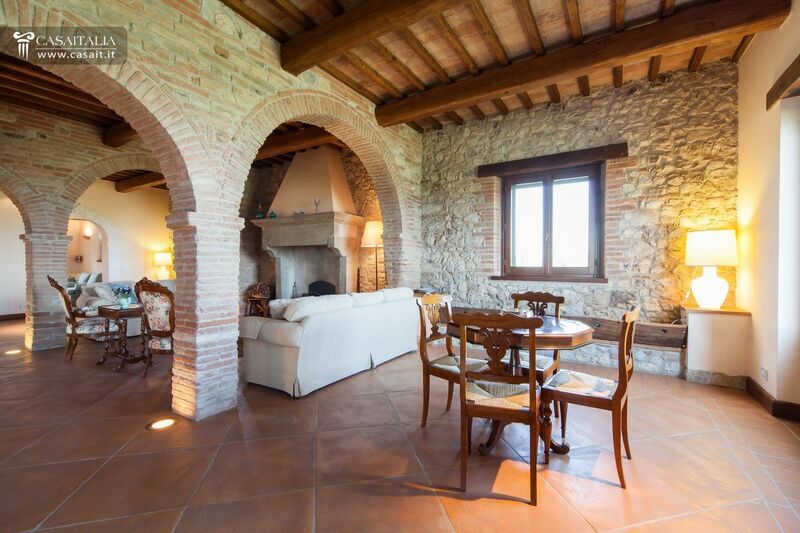 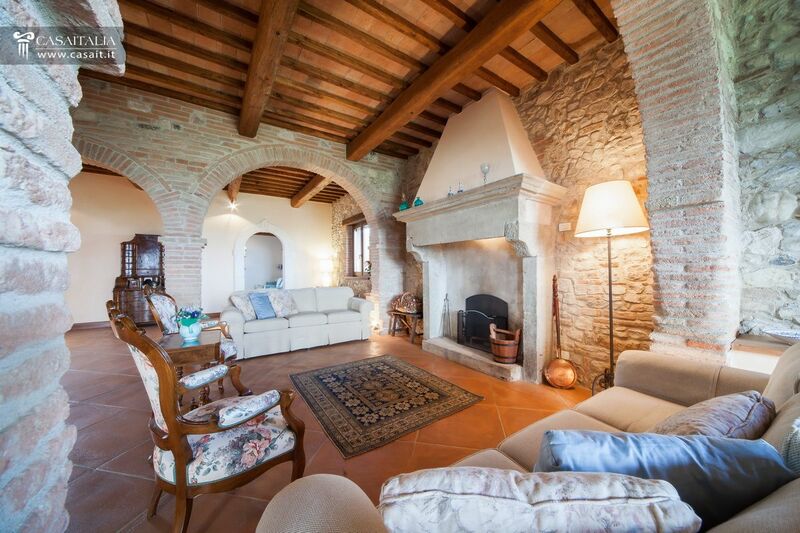 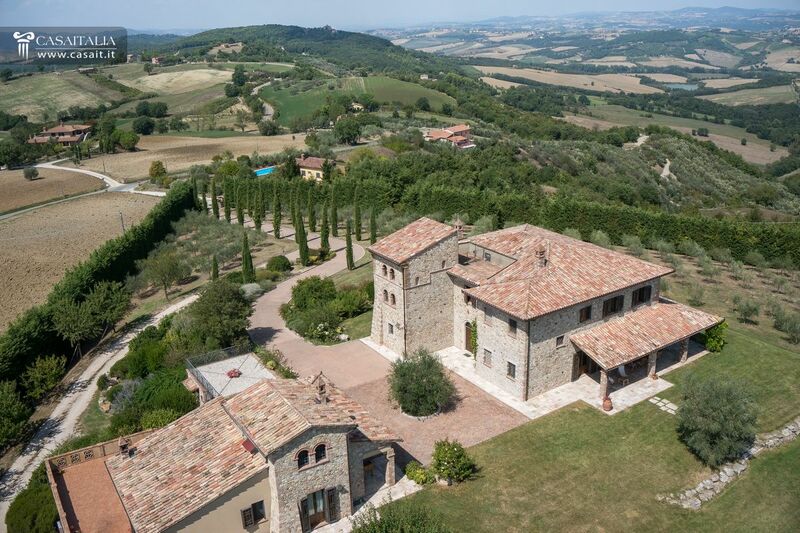 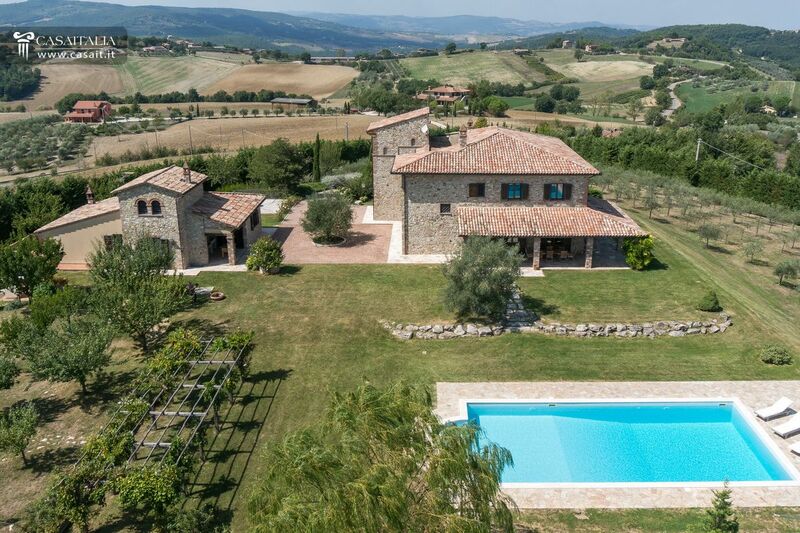 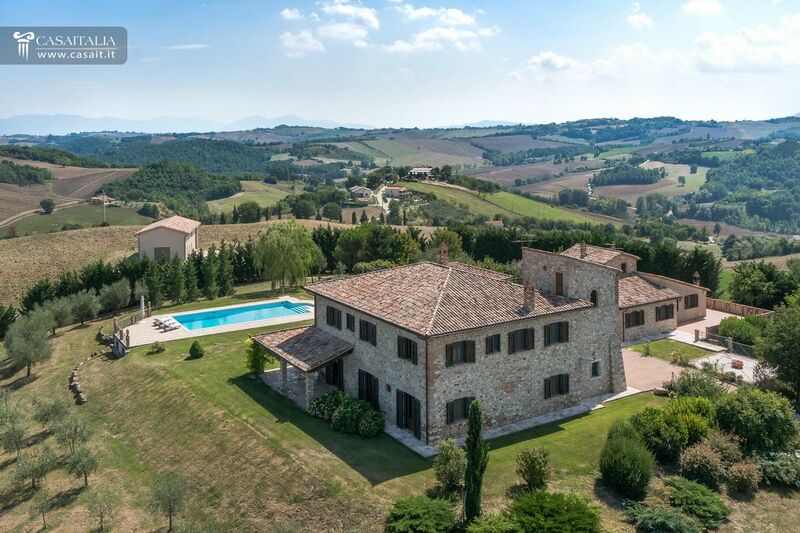 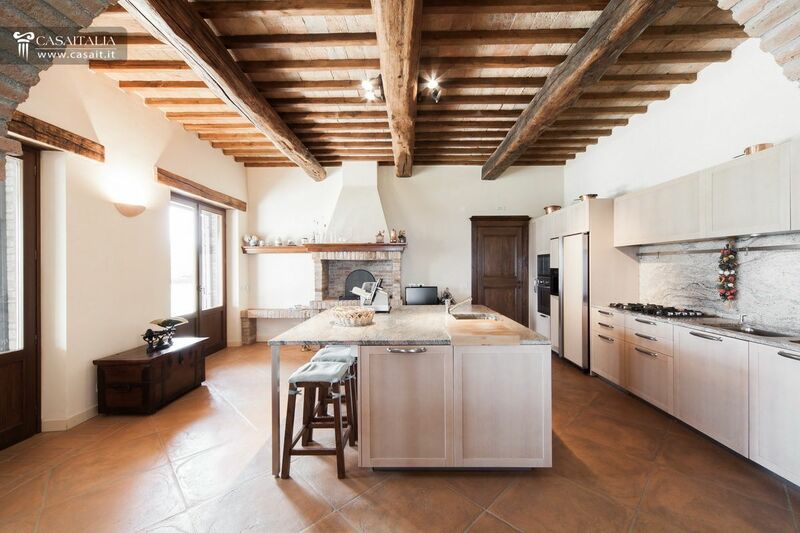 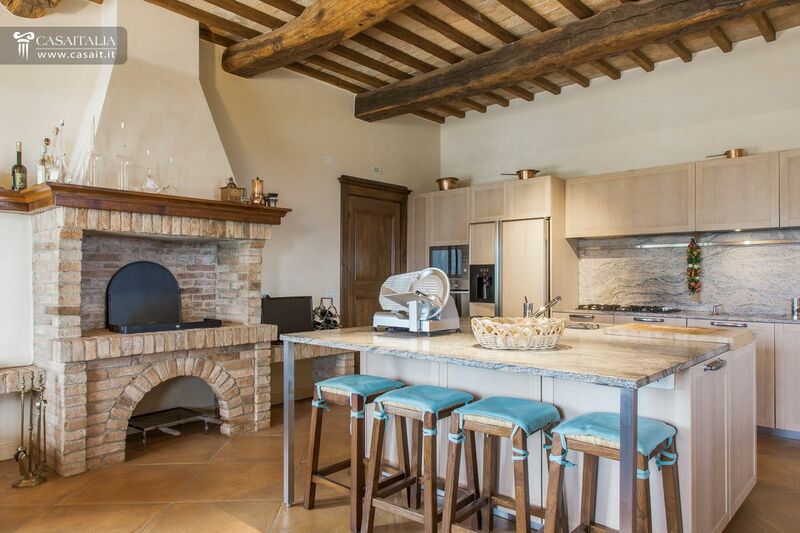 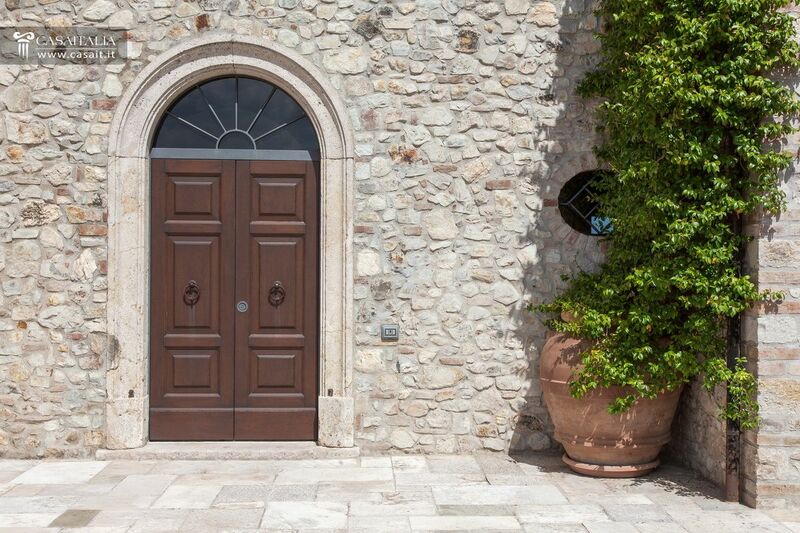 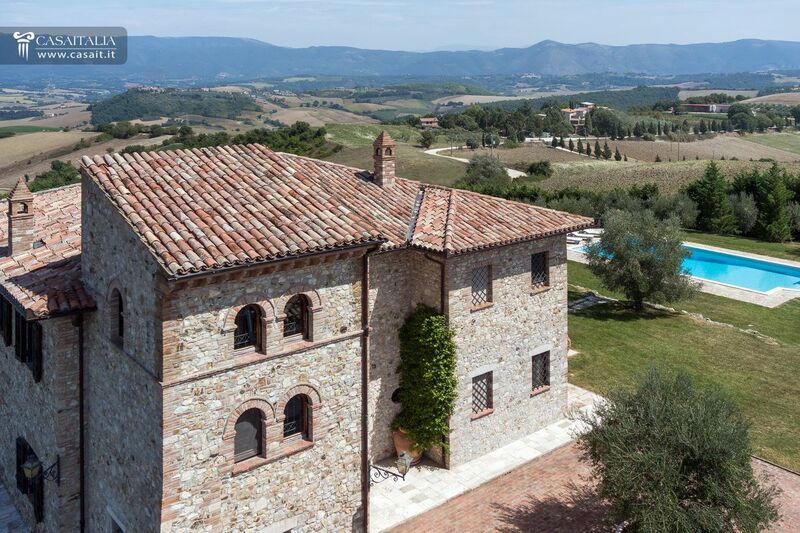 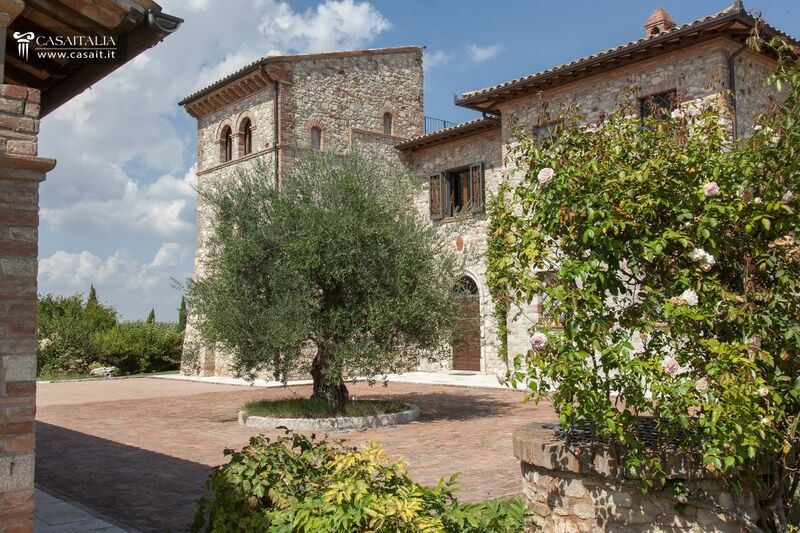 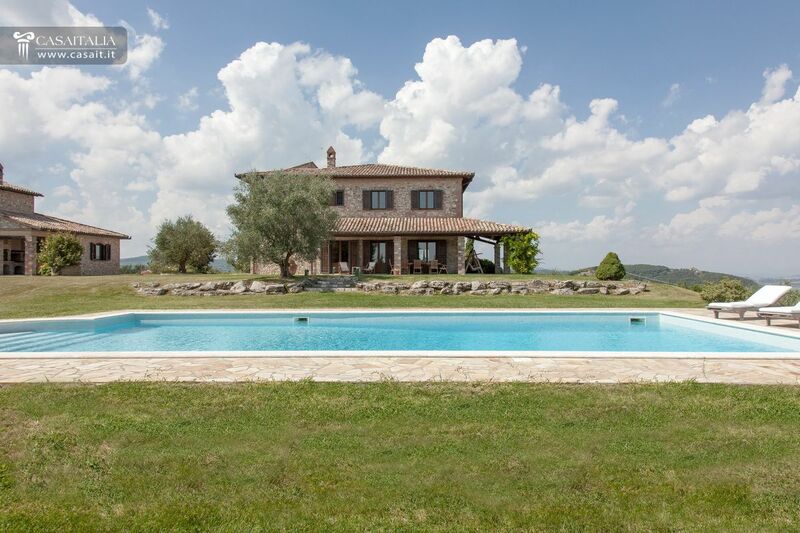 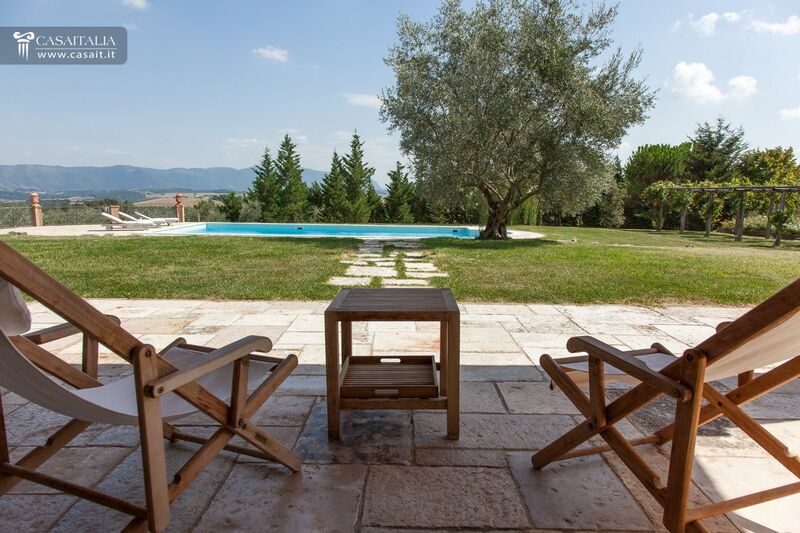 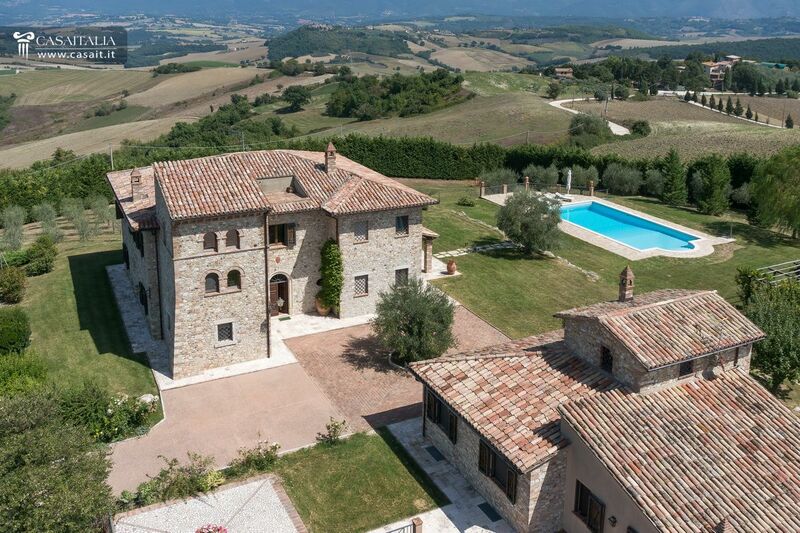 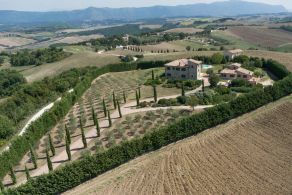 Casale l’Altura is a beautiful property for sale 11 km from Todi, immersed in the greenery of the Umbrian hills, which it overlooks thanks to its panoramic location with 360° views. 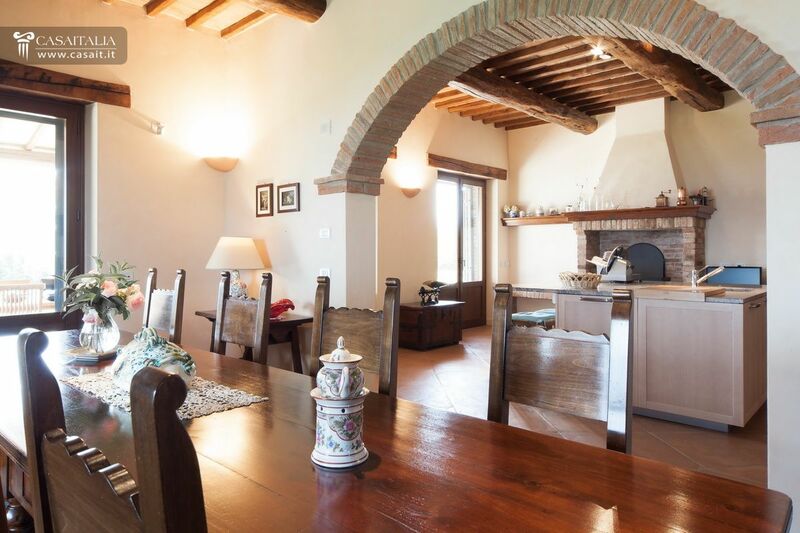 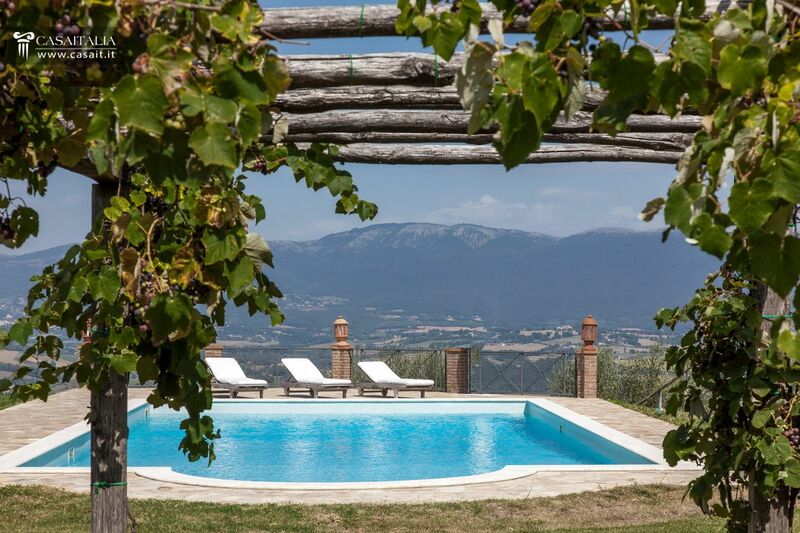 The property is comprised of the farmhouse and an outbuilding, surrounded by 1.4 hectares of private land, with garden, swimming pool, olive grove and small vineyard, secluded but unisolated within an unspoiled landscape. 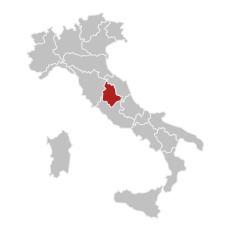 The nearest populated area, with a food shop and restaurant is just 2 km away, Todi (11 km) and Avigliano Umbro (7 km) are a few minutes away by car, while Rome, thanks to the E45 motorway 9 km away, can be reached in an hour and 20 minutes (116 km). 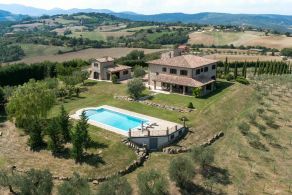 The closest airport is Perugia (57 km), just under an hour by car, while Rome Ciampino and Rome Fiumicino airports are 134 and 152 km away. 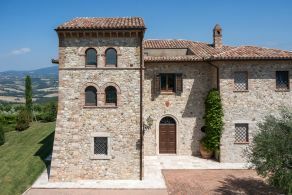 In a panoramic location and characterised by a traditional tower, it has a total surface area of 471 sq.m on two floors, plus a loft on the second floor of the tower. 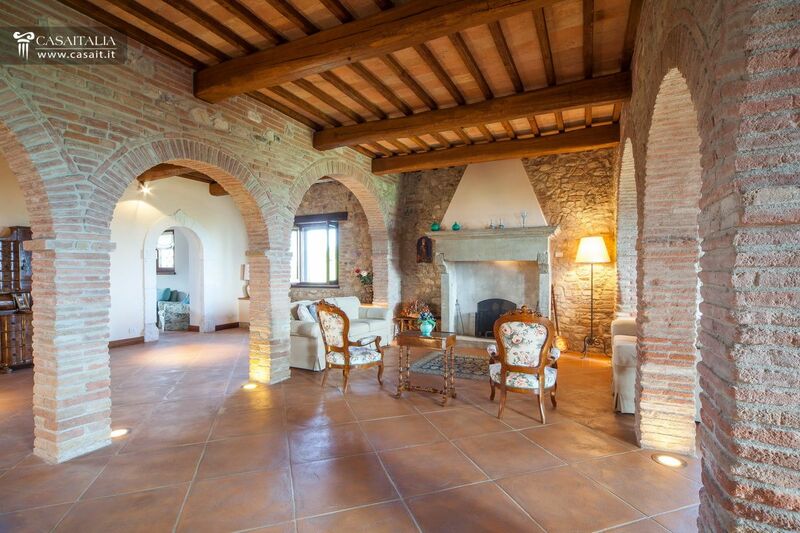 The entrance opens into a large hall with fireplace, separated by two typical arched brick walls, skillfully lit from the bottom. 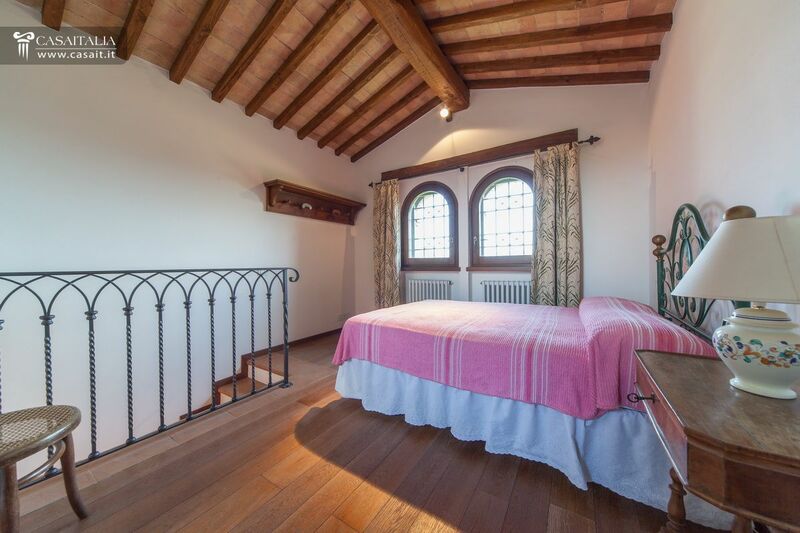 To the right of the entrance, on the ground floor of the tower, there is a studio/bedroom, while on the left hand side there is a large kitchen with fireplace and the dining room, both with access to the pretty outside porch of 70 sq.m, a bathroom for the living area, a storeroom, the lift and the staircase to access the floor above. 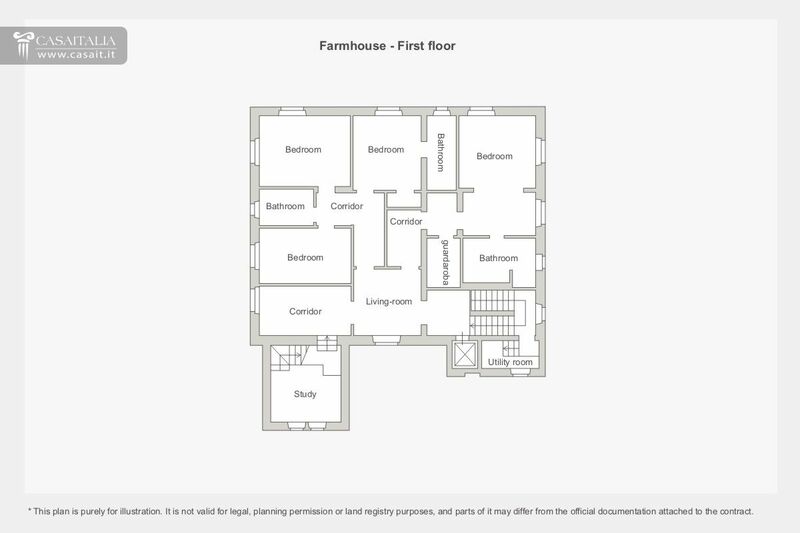 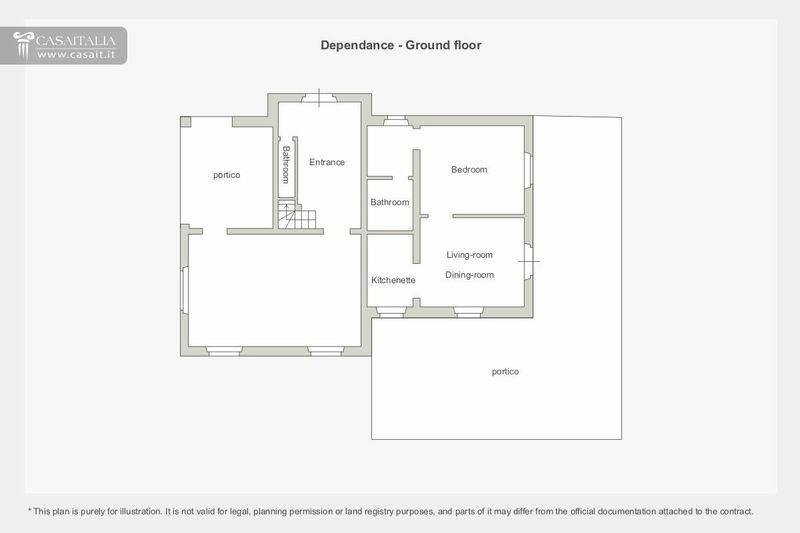 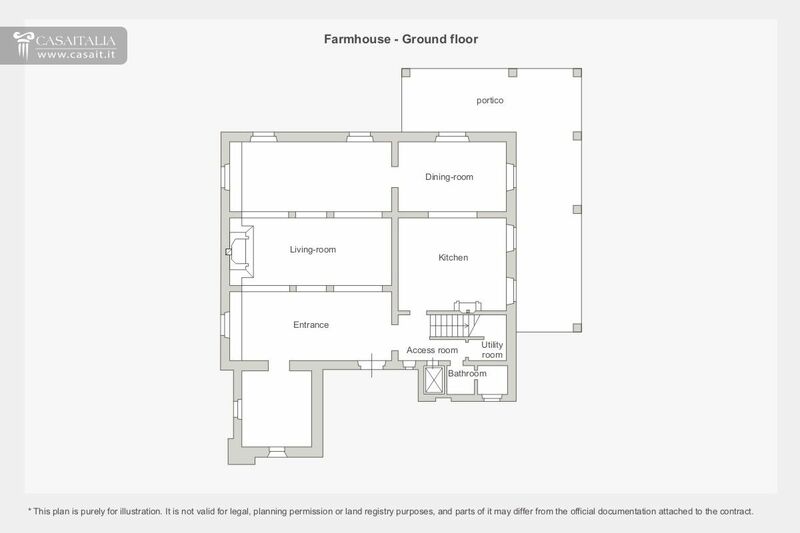 The whole first floor is used for the sleeping area, with 4 bedrooms, 2 with ensuite bathrooms, a living room and connecting with the tower, another bedroom/studio. 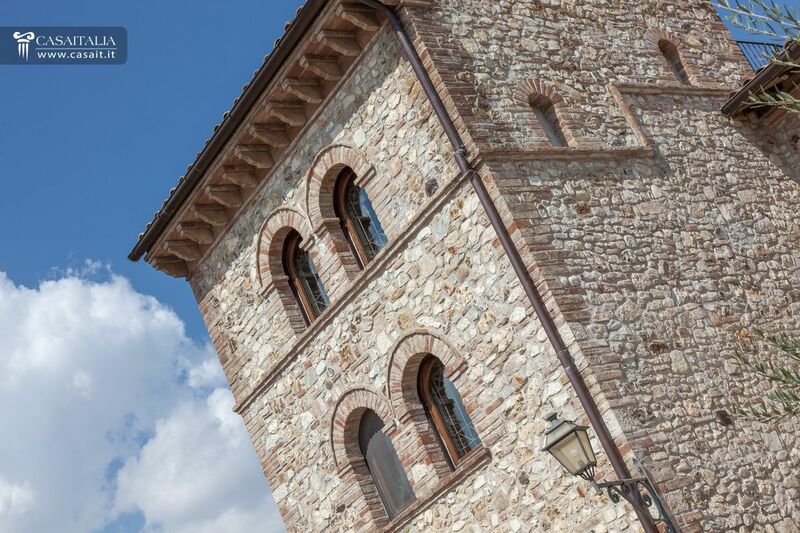 On the top floor of the tower, there is the loft. 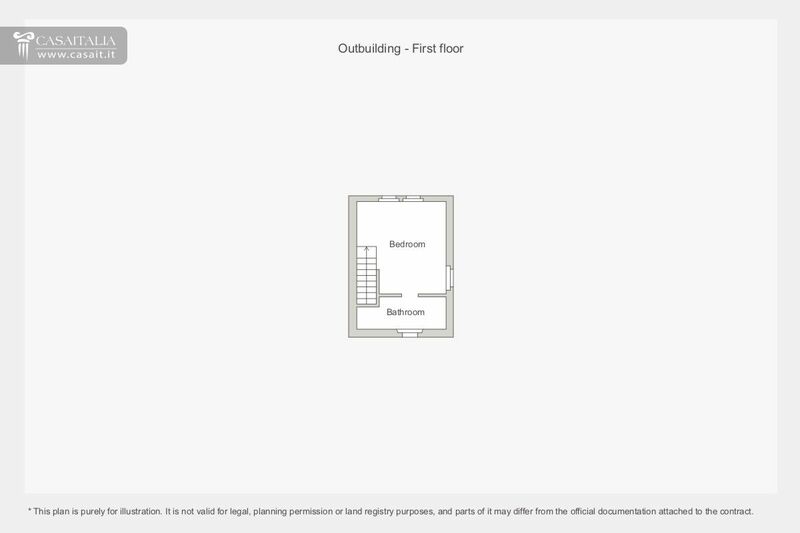 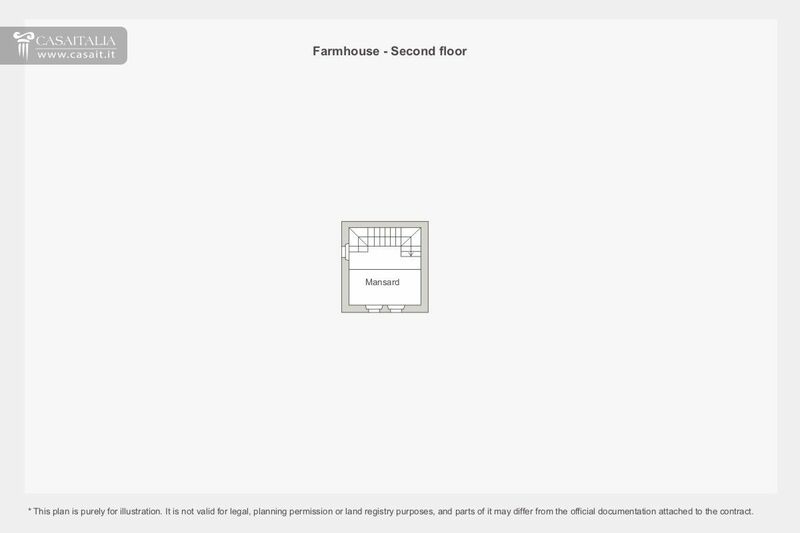 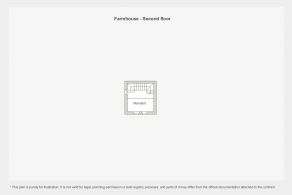 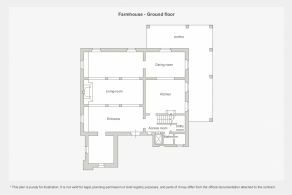 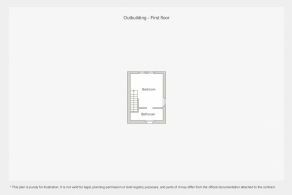 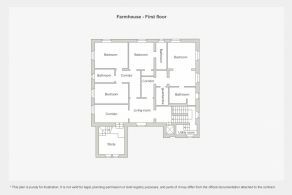 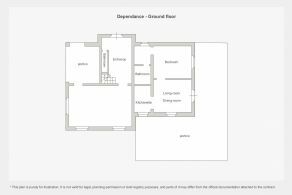 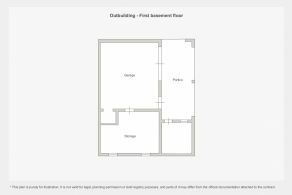 The outbuilding, which is alongside the farmhouse, has three floors and a total surface area of 247 sq.m, with 105 sq.m at the basement level, with a car park for 3 cars, a storeroom and a utility area. 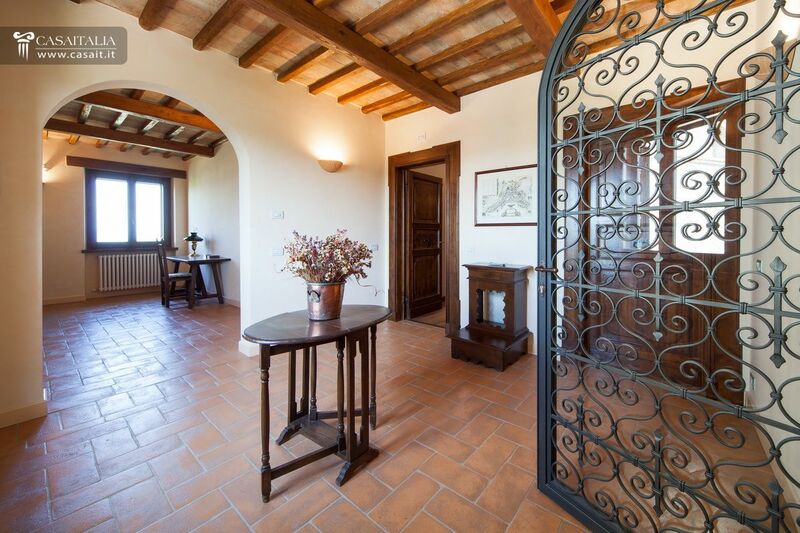 Comprising pretty entrance, hall with access to the outside porch (17 sq.m) with wood-burning stove, bathroom and, on the floor above, a bedroom with bathroom. 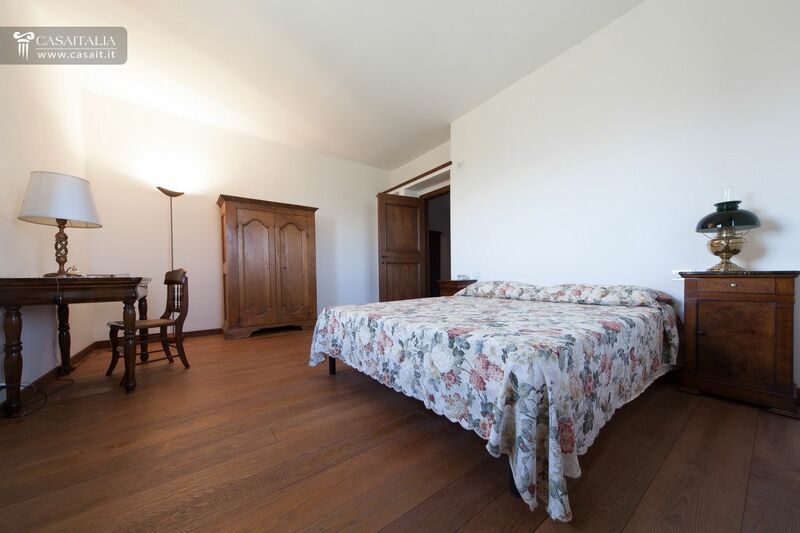 With living/dining room with access to the porch (74 sq.m), kitchenette, bedroom and bathroom. 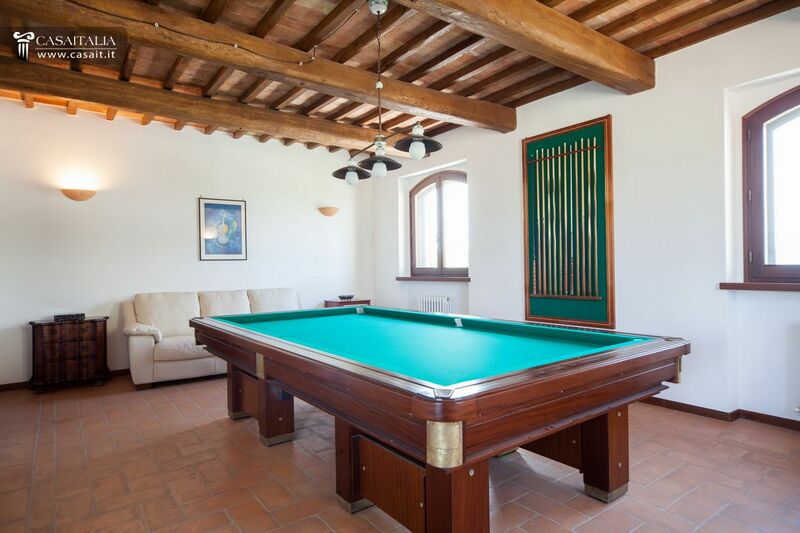 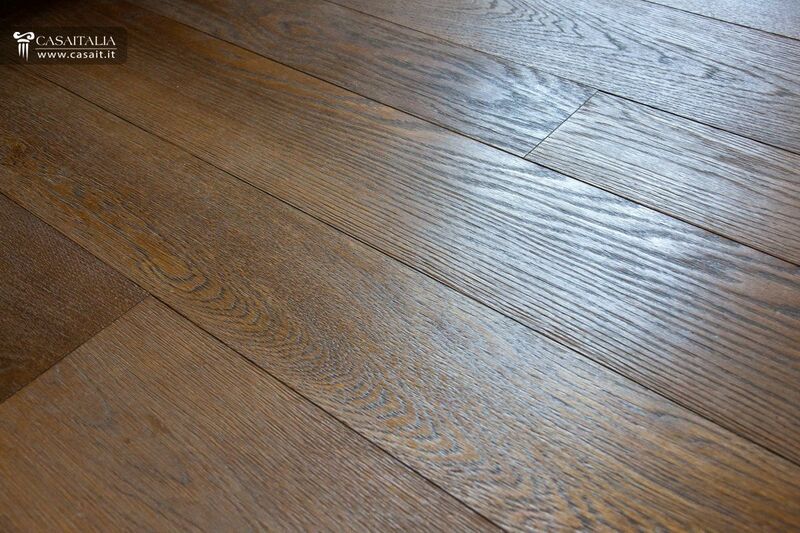 Finally, the property includes an 8 sq.m storeroom in the basement, and the technical area for the swimming pool. 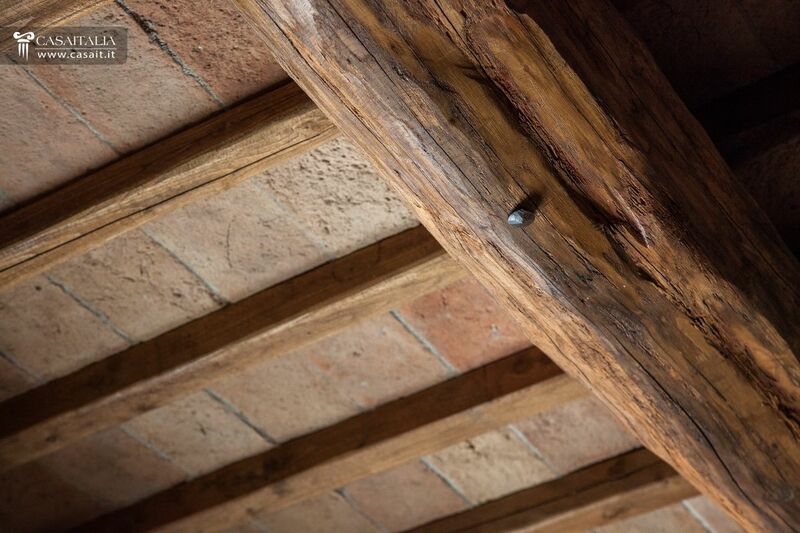 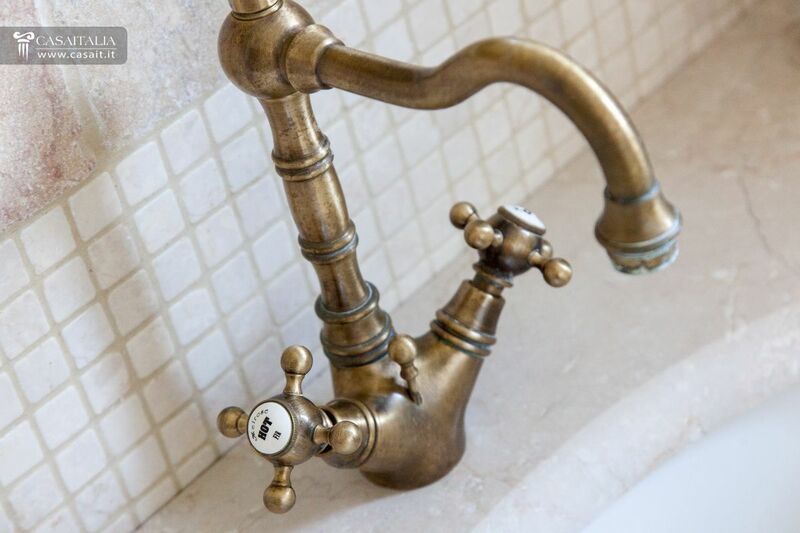 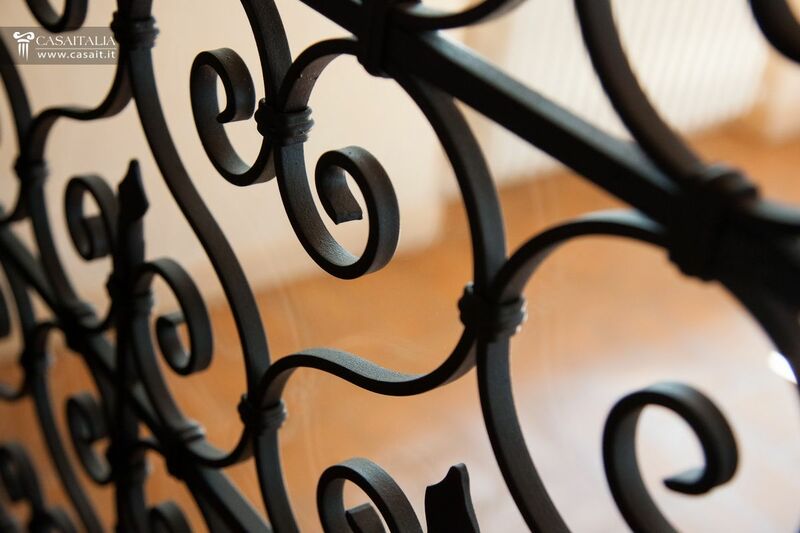 The farmhouse and the outbuilding have been fully restored, using traditional materials, and they are in perfect condition. 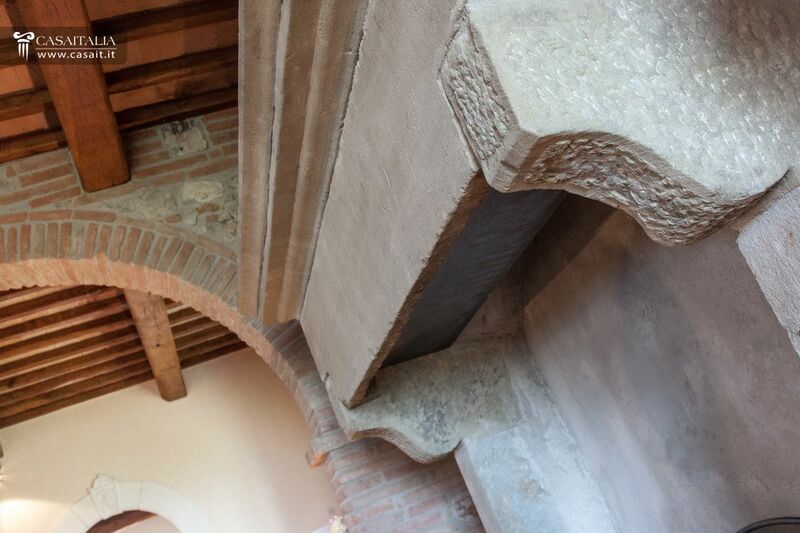 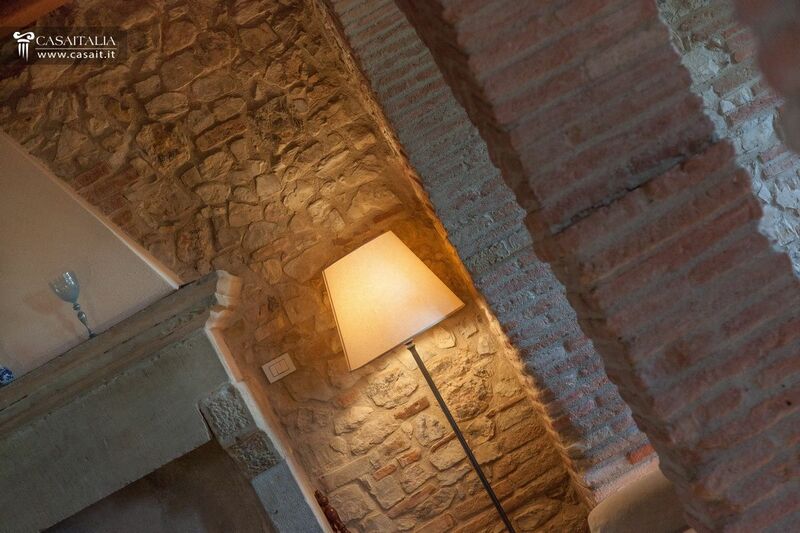 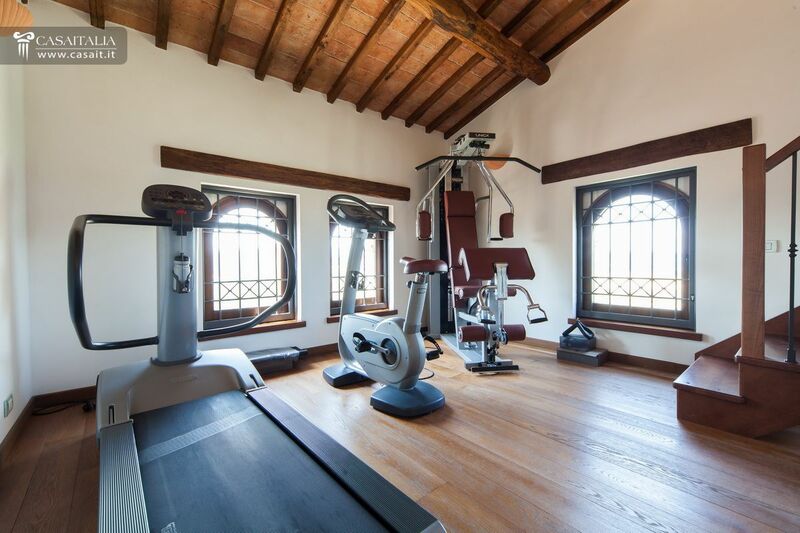 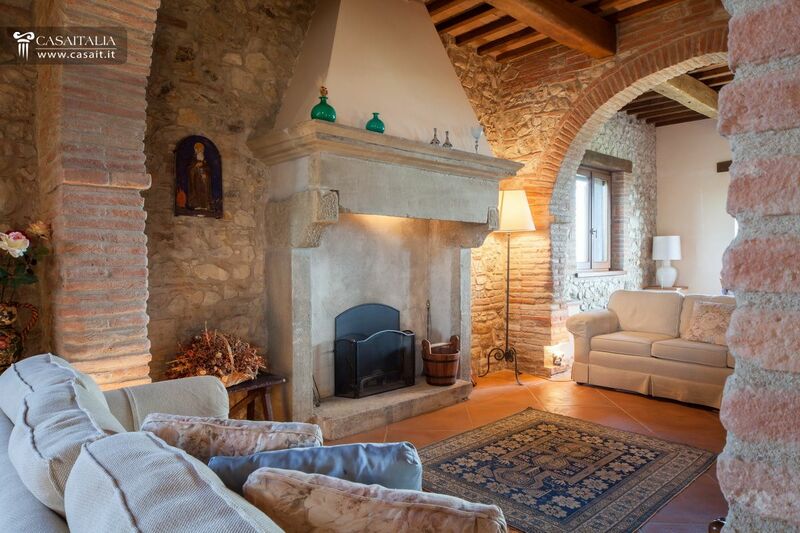 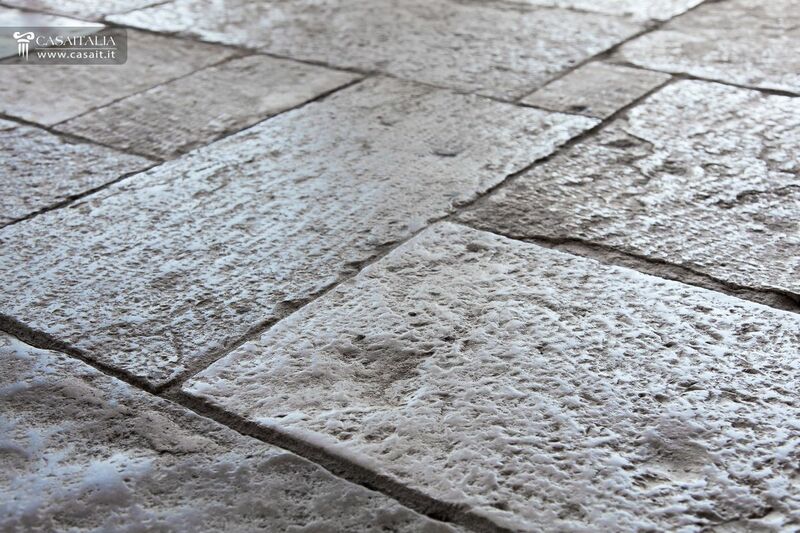 Inside, there are tiled floors in the living areas and wooden ones in the sleeping areas, ceilings with exposed tiles and beams, stone fireplaces, some exposed stone walls and traditional brick arches in the large hallway on the ground floor. 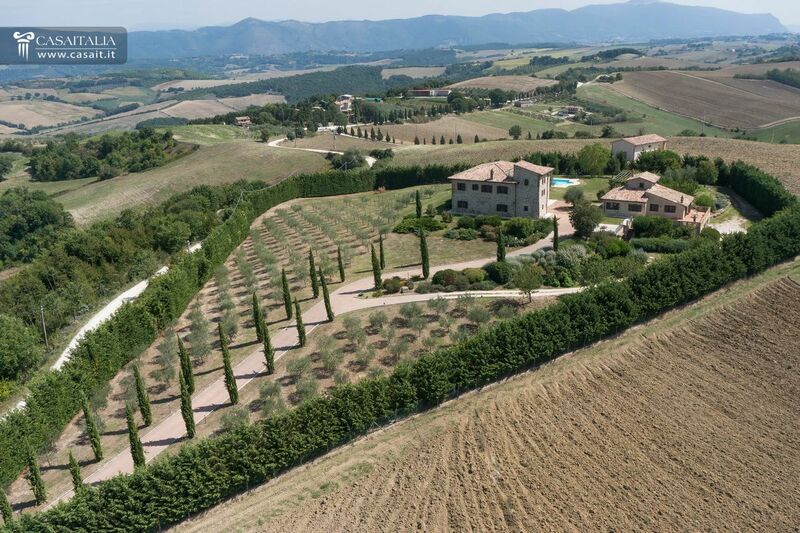 The property includes around 1,4 hectares of land, completely fenced off. 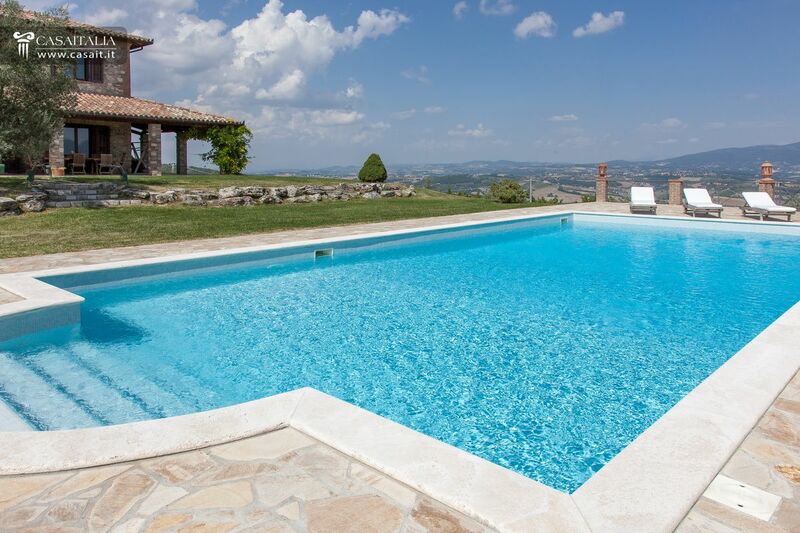 The area immediately surrounding the houses is used as garden, with a swimming pool 7,5 x 16m wide and 2.20m deep. 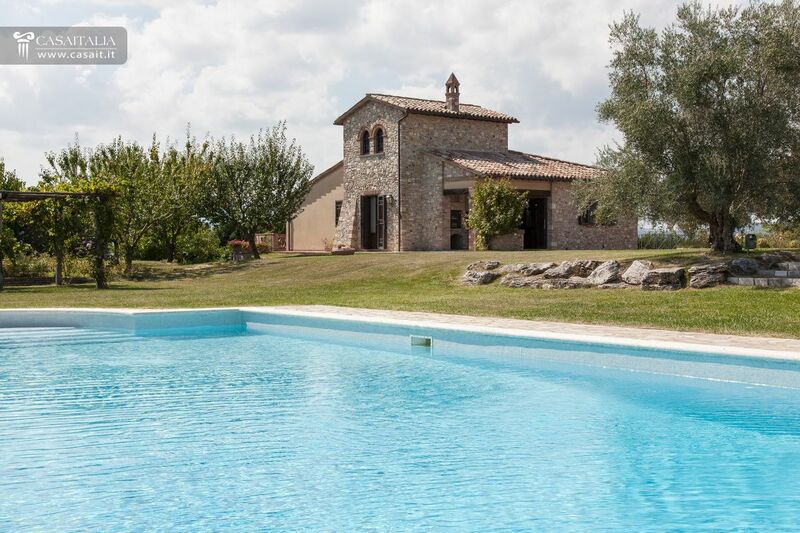 Thanks to its commanding and extremely panoramic location, unisolated but still secluded, just 11 km from Todi and less than an hour and a half from Rome and its airports, Casale l’Altura is the ideal property in which to relax, immerse oneself in the peace and quiet and nature, at weekends and during the holidays. 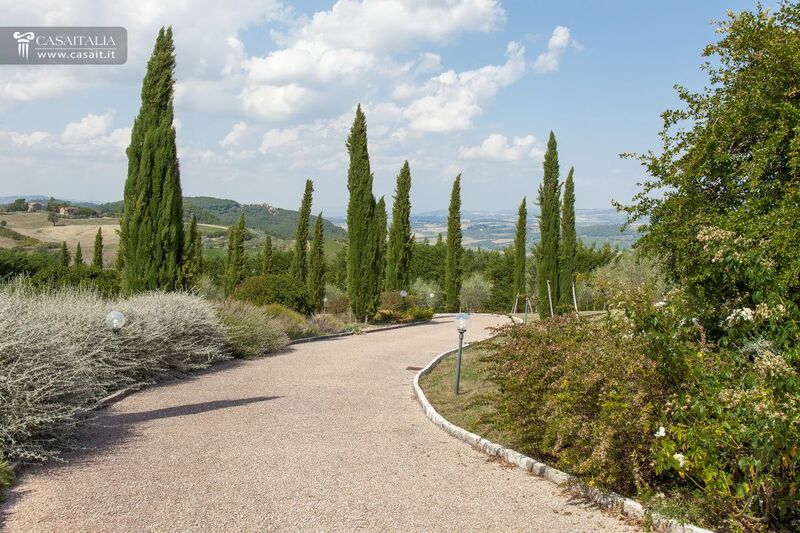 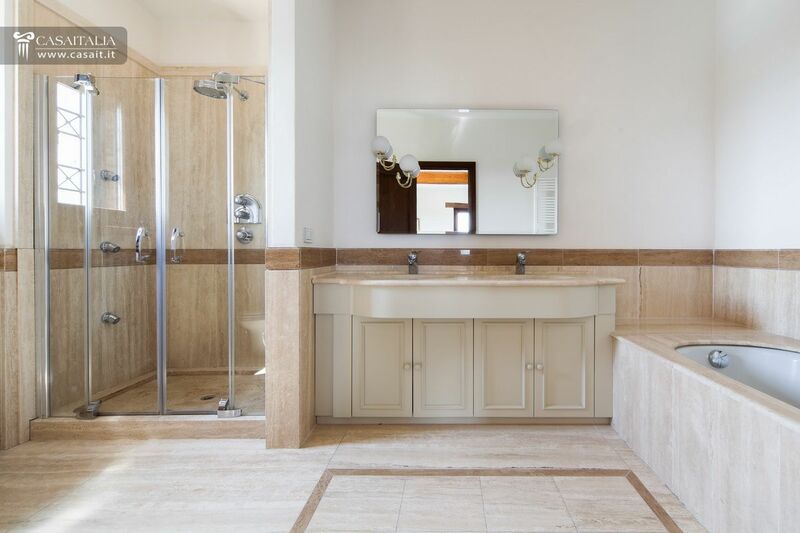 In addition, the size of the included land means it would be possible to have a permanent residence for staff, making it nice and easy to care for the property.